The American DJ Pro Par 56RGB is a black ultra-bright Par 56 with variable RGB temperature control. The 12 Red, 12 Green, and 12 Blue LEDs give you great control for whatever light you want to use. Use these lights to set the mood for your special events, create something unforgettable. 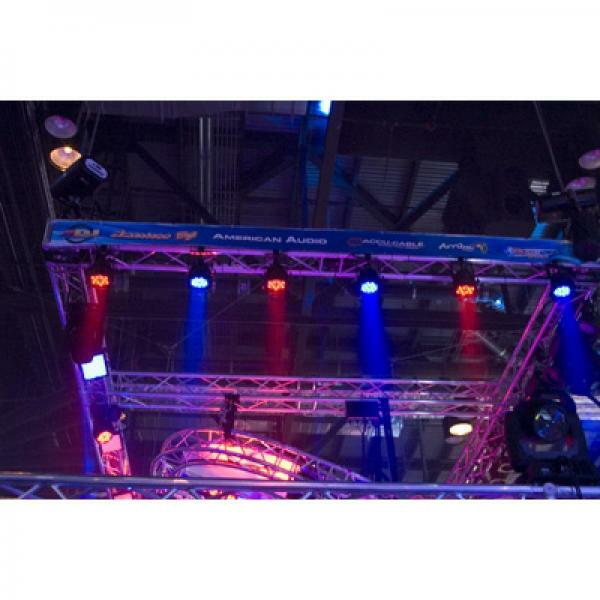 These lights are bright and strong allowing you to highlight the most important parts of your stage in three different colors. The LEDs used have a very long life with over 50,000 hours. 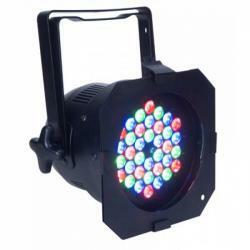 Perfect for any performance where light is shined on the performers for long periods of lime. Traditional Par Cans emit a lot of heat onto performers, the American Dj Pro Par 56RGB has low power consumption and low heat which allows you to use more light with less heat for your performers. With four operational modes, including DMX, sound active, and master slave you can set up whatever effect you need at your current venue. With Dimming ranges of zero all the way to 100% your stage will never look better. Setting up is easy with the dual bracket system, hang it up or set in on the ground, whatever your needs, the Pro Par will do the job. Weight: 6 lbs. / 2.46 kgs.